this article we will examine session hijacking, I will describe the theory behind session hijacking, demonstrate the technique in practice, and discuss detection and prevention tips. The term session hijacking is thrown around frequently and encompasses a variety of different attacks. In general, any attack that involves the exploitation of a session between devices is session hijacking. When we refer to a session, we are talking about a connection between devices in which there is state. That is, there is an established dialogue in which a connection has been formally set up, the connection is maintained, and a defined process must be used to terminate the connection. When we talk about sessions theoretically it’s a bit confusing, so it may help to think of a session in a more practical sense. As we have seen in previous attacks, nothing that goes across the network is safe and session data is no different. The principle behind most forms of session hijacking is that if you can intercept certain portions of the session establishment, you can use that data to impersonate one of the parties involved in the communication so that you may access session information. In the case of our earlier example, this means that if we were to capture the cookie that is used to maintain the session state between your browser and the website you are logging into, we could present that cookie to the web server and impersonate your connection. If that sounds too good to be true from an attackers standpoint, well….it is. 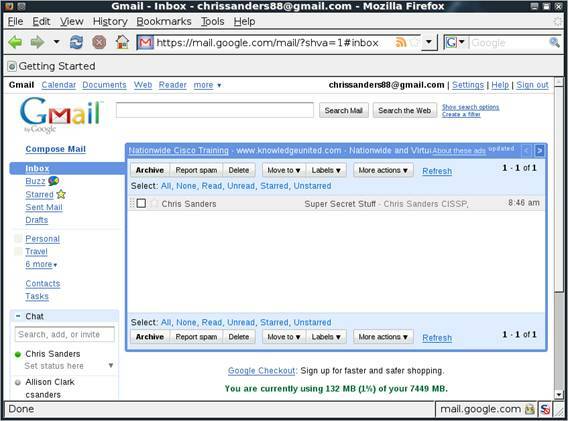 Once you have captured the traffic of the victim user browsing to Gmail you will need to save the captured file into the Hamster directory. 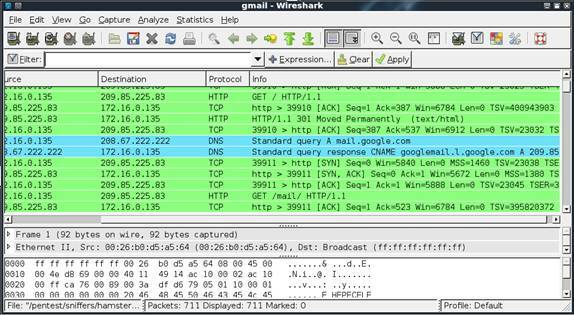 For the purposes of this example, we have named our file victim_gmail.pcap. When that file is in place, we will use Ferret to process the file. 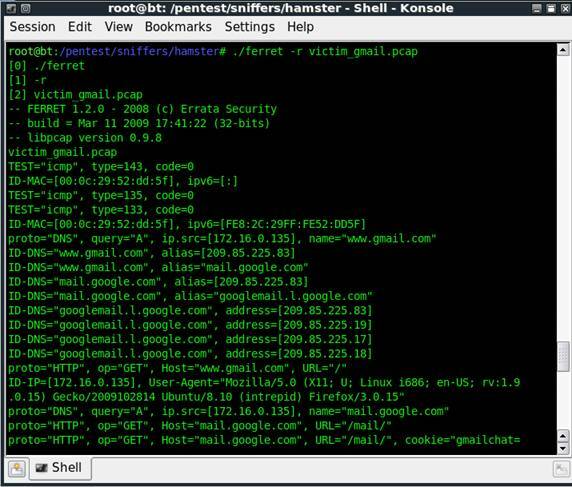 This is done by browsing to the Hamster folder and running the command, ferret –r victim_gmail.pcap. Ferret will process the file and create a hamster.txt file that may be used by Hamster for the actual hijacking of the session. Now that the proxy settings have been applied you can access the Hamster console in your browser by browsing to http://hamster. Hamster will use the file created by Ferret to produce a list of IP addresses for whom session information has be intercepted and display those IP address in the right pane of the browser. Our file we’ve created only contains a single IP address of the victim, so if we click that the left pane will be populated with the sessions available for hijacking. Save Online Banking for Home - The chance of somebody intercepting your traffic on your home network is much less than on your work network. This isn’t because your home computer is more secure (let’s face it, its probably less secure), but the simple matter of fact is that if you only have one or two computers at home, the most you have to worry about in terms of session hijacking is if your 14 year old son starts watching hacking videos on YouTube. On a corporate network you don’t know what is going on down the hall or in the branch office 200 miles away, so the potential attack sources multiply. One of the biggest targets for session hijacking is online banking, but this principal applies to anything. Be Cognizant - Smart attackers will not leave any evidence that they have been in one of your secure accounts but even the most seasoned hackers make mistakes. Being aware when you are logged into session-based services can help you determine if somebody else is walking in your shadow. Keep an eye out for things that seem out of place, and pay attention to “Last Logon Time” fields to ensure everything matches up.